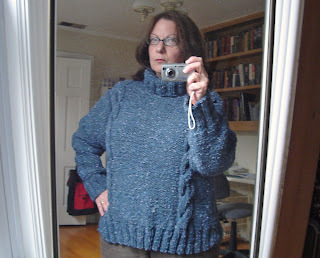 A recent thread in the Ravelry 'Rowan Love' forum reminded me of a sweater I made this past Summer. 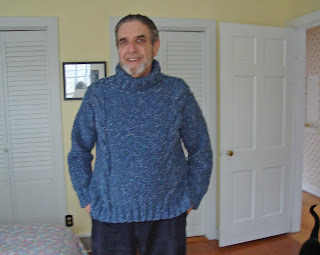 It is a menswear pattern called Mason from the exquisite Rowan Vintage Knits book. Besides the fact that I already had the yarn (Rowan Yorkshire Tweed Chunky in Coast, a greyish blue tweed) and wasn't sure what to do with it, I don't know why I decided to knit a man's pattern for myself. The photo in the book was kind of macho looking. One feature of the sweater was the description which suggested that it would be good for winter gardening. That is probably what sold me. Pretty Cute, yes? I knit this sweater in a man's small which was meant to fit a 38" chest. As you can see from the photo, I am pretty chunky (though NOT as chunky as the photo makes me look). My chest is more than 38" and I usually wear a store-bought women's large, which would translate to a man's medium. Now maybe my gauge was off, but not that off. I chose the size small based on the finished measurement which was 45" around. That is pretty big for a small, and 3-5 inches bigger than I usually knit for myself. The only modifications I made were to shorten the body a little and the sleeves a lot. I also narrowed the sleeve because I hate floppy sleeves. And I left off the huge cable that is supposed to run down the arm, thinking it would broaden my already broad figure. It fits my husband, who usually wears a man's large. And he likes it. He has never liked a sweater that I've made for him. He actually asked to try it on when he saw it. So now I know that if I ever knit him a Rowan design I will probably chose the size small. Never in a million years would I have thought to do that if I hadn't seen him in this sweater. Anyway, I like the sweater too. It is comfortable to wear and move in; the largeness is not too floppy. I can see myself doing my winter pruning in it, but I guess I will have to share. Best wishes for a Merry Christmas and a peaceful New Year. well...i might learn something about knitting yet! pretty impressive writing! I've been looking at this pattern, and come to the same size conclusion! I've knit from Vintage Knits for my husband both Jarret and Beau in a size large. Very odd. Thank you for the notes, shall proceed with the size small.